XCalibre packs enough punch to take anglers out to where the big fish are biting, combined with the right facilities for fine dining after the action's over. Lindsay Wright got a taste of the good life, looking for marlin off the Kaipara Harbour. The crew at Calibre Boats don't know anything about boat tests. As their latest product, the shapely black sportsfisherman, XCalibre noses up to the long jetty at Shelly Beach in the Kaipara Harbour, there is no chamois cloth out polishing or sumptuous lunch on the saloon table. "G'day - are you coming fishing?" company director Craig Ross grins up from the deck and we head for the (harbour) bar. As the sporty fishing boat powers up and pops onto the plane, there are introductions all round. Craig's father Greg is on the helm and brother Phil Ross is down in the cockpit rigging fishing gear. 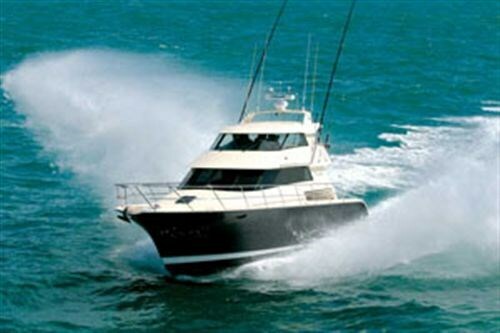 There are a few lifetimes of Kaipara fishing experience on board and it shows in the well-oiled teamwork, the purposeful layout and XCalibre's quality fitout. "We went to Craig Loomes about five years ago and asked him to design a boat for us to use fishing out of the Kaipara with... something that could handle a rough day on the bar, so we could get out whenever we felt like it," Craig explains. Work began in a woolshed on the family farm, near South Head, about four and a half years ago. "We meant to build the boat part time - but got sidetracked a bit." 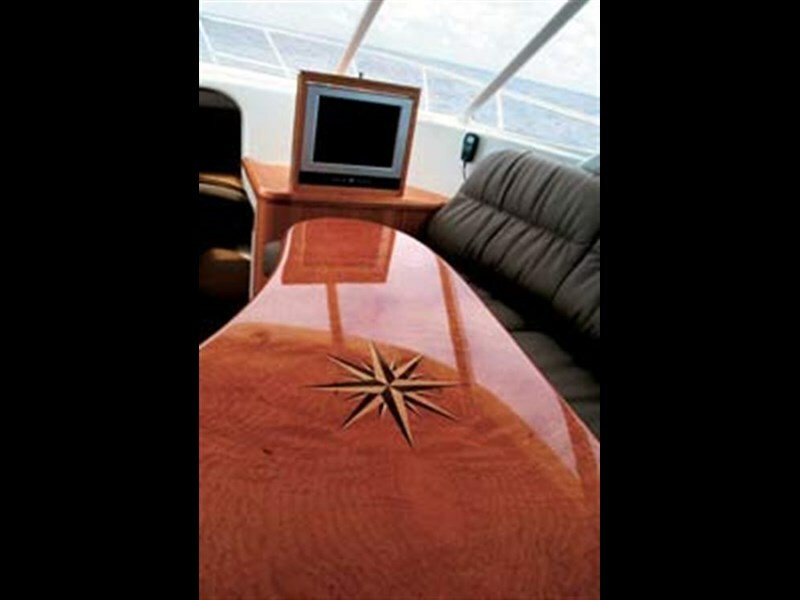 An essential element of craftsmanship is time and XCalibre's unhurried build period shows in many small ways; the exotic wood compass rose inlaid into the American cherry burr saloon table, teak decking on the cockpit coaming steps and trim pieces around the rod holders in the gunwale. There are quality touches everywhere that underscore the boats custom-built background. The hull was built with computer-generated female frames and a 20mm core of airex foam encased in an e-glass layup with lavish use of Kevlar in stress and possible impact points. Along the way Craig quit his job as a boatbuilder at Vaudrey Miller - Calibre Boats was born and XCalibre trucked to the new company's premises in Kumeu. After intensive market research, two Yanmar 6LPAM-STP, 315 horsepower diesels were chosen to supply XCalibre's motive power and, on the calm waters of the inner Kaipara Harbour their combined horsepower drove the nine tonne boat at a comfortable 26 knots (48 km/h). Settled back in the leather upholstery of the flying bridge/wheelhouse, about four metres above the waterline, conversation continues in a normal tone and XCalibre feels like much more boat than her 11.5m LOA and 3.8m beam would suggest. ZF 2.45:1 remote-mounted gearboxes and V-drives apply the power to the water via ZF 21" x 30" four-bladed propellers and the engines are fresh water cooled via heat exchangers. 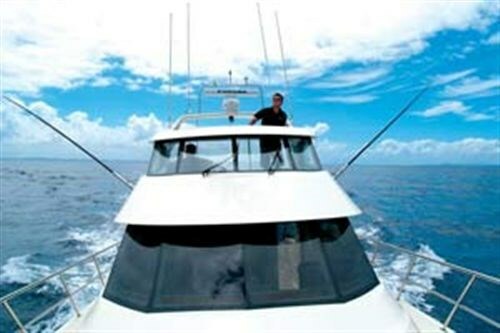 Exhaust gases are dumped into an underwater separation box moulded into the bottom of the hull to reduce noise, fumes and create a fuss to lure cruising game fish. The props spin in specially designed recessed "half tunnels" to give her the minimal 800mm draught needed for rough water bar crossings. XCalibre carries 600 litres of fuel in each of two integral fibreglass wing tanks, which Craig says give her a range of 440 nautical miles (815km) at 2800rpm (19 kts) or 54.5 l/ph. She has 275 mile (509 km) endurance flat out at 3900 rpm. Out at the bar, we do a few high speed runs over the 1.5m Tasman Sea swells that are sweeping in to crumple over the sandy shallows. XCalibre soars over them with ease. It's possible to stand comfortably in the aft corners of the cockpit with arms crossed, lean back against the gunwale and stay perfectly dry as the boat's fine forward sections throw sheets of spray off to the side. Greg at the helm browses around a bit in the confused water behind the bar to get a feeling for how the boat behaves beam onto the swell and XCalibre stays dry and predictable. XCalibre's design stablemates include some of the most innovative boats around. The distinctive new yellow Auckland water taxi is one other recent example of the combined talents of Calibre Boats and Craig Loomes Design group. 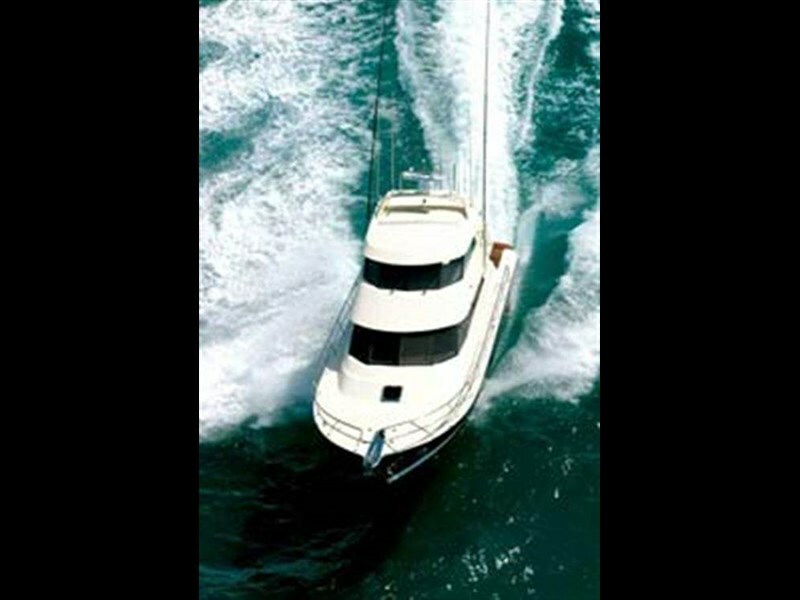 Loomes' has a large portfolio of unique vessels which are already out and doing it: the wave-piercing sportfisher, Ultimate Lady, paramount among them and Calibre Boats has the high tech expertise and innovative hands on attitude to make them work. A 24m foil vessel called EarthRace is currently under construction at Calibre's Kumeu premises, designed by Loomes to complete the world's first bio fuel-powered equatorial circumnavigation. Calibre has also bought the moulds for the 7m Tournament and is producing the nuggety little fishing boats with a range of power options. Out at sea, XCalibre's fishing team swing into action and we're soon on to a small school of kahawhai, three of which are jigged aboard as live bait for when we get on to the "real fish." The wheelhouse sun roof is slid back and locked in place for two people to go on lookout for signs of marlin. Did they consider a tuna tower? "Nah," Craig dismisses the suggestion, "it'd just make her look ugly and you've got plenty of height through the sun roof anyway." The leather helm seat folds down and, with the small seat off to port, creates a comfortable lounging area while keeping an eye on the lures. From the helm seat the Yanmar single lever engine controls fall easily to hand and the moulded console shades electronic screens, engine instrumentation and switches so that they're readable even in direct sunlight. The raked 6mm thick toughened glass windscreen undoubtedly helps here and hot air is ducted from the engine cooling system for demisting. There is stowage everywhere in XCalibre's wheelhouse. A small locker with gas strut provides paper chart and navigational tool stowage with plenty of room to spread them out on the huge console area. Lifejackets, general gear or people fit comfortably in the area behind the seating with a bird's eye view of the action on deck and another huge locker is available under the wheelhouse deck. The thick silver rim of the U-Flex manual hydraulic steering system took me a bit of figuring out until I finally ask Craig what sort of metal it was made of…burnished stainless?... titanium? "Squeeze it," he laughs and I feel a bit sheepish as the thick plastic padding gives under my grip. On the subject of squeezing though, a few more hand holds would be handy around the wheelhouse. A neat, recessed stainless rail is provided for the stairs but there isn't a lot to hold onto up where the motion is most noticeable. This is something a new owner would add to suit himself perhaps. XCalibre inches across the screen of the Furuno Navnet GPS/chart plotter to where the team had hooked a marlin the day before and, in trolling mode, the Furuno Navpilot 511 takes over the helming while the bright big lures are deployed astern. A 1000 watt Furuno sounder/fish finder and 36 mile radar complete the Navnet package. A striped marlin clears the water off our starboard bow and a flurry of activity follows in the cockpit until two kahawhai bait fish are lolling in our wake. XCalibre's long gestation period is also evident in the thoughtful cockpit layout. The sweeping mouldings and sides were laid up over polystyrene formers Craig explains, to give their unique shape. A central, metre high insulated icebox keeps either lunch or catch cool and also allows for comfortable seating. An additional perch is provided by a fold down seat on the aft side of the icebox and Phil demontrates the sliding transom doors that part to allow access for the really big fish. All cleats and obstrusive hardware are recessed to minimize their line snagging potential. Scuba divers or swimmers are catered for by a set of six steps that telescope out from a hatch neatly fitted into the cockpit deck at the transom. A removable live bait tank is located under another hatch in the teak deck. Lifting it out provides access to the hydraulic rams and rudder stocks for the two stainless steel spade rudders. Four more roomy gear stowage lockers are located under other hatches in the deck and two long lockers in the cockpit coamings provide stowage for deck brooms and wash down gear. A salt water outlet for the deck wash pump is located under the starboard one. Another clever idea back here is the rod holders moulded into the gunwales which drain into a common scupper system which sends any water that gets into them, or the deck hatch drains, back overboard. A TMC 12000 l/ph bilge pump in the sump aft deals with any water that gets belowdecks. The shower/toilet cubicle to starboard has a varnished teak deck for easy cleaning and discharges both sewage and grey water waste into 100 litre holding tanks. Out on deck, XCalibre is all business, focused on the serious task of landing gamefish, but just a door away there's a separate world of relaxation. Stepping into the saloon straight away mutes the noise from the two underfloor diesels and the bright sunlight outside is softened by the 8mm thick toughened and tinted glass windows. Traditional teak and holly flooring, with the beautiful whirling cherry and madrona burr joinery, gleam with reflected light and the muted grey leather upholstery sighs as you settle in. Craig Loomes Design in-house interior designer is responsible for the ambience here and should take credit for the restful interior. A 12v Isotherm stainless steel fridge keeps the drinks cool below the bench and a 15" LCD screen pops up from a lacquered ledge forward to provide DVD/CD/MP3 or AM/FM entertainment. A boomerang-shaped galley, with stainless steel and cherry wood counter, winds around the port side of the saloon with a Caprice stainless steel four burner hot plate, grill and oven ready to whip the days catch into class cuisine. A 45-litre Isotherm hot water system works off an engine heat exchanger and Alphatron inverter provides AC power. There are 500 litres of fresh water in an integral tank for domestic use. Further forward XCalibre has a vast area skirted by two tiers of bunks. The muted green upholstery serves to highlight the wood joinery and access is by a stylish set of carpeted stairs. At trolling speed engine noise is almost non existent and water noise is muted through the foam-cored hull. The forward cabin sleeps eight - which would be a bit cramped in the long term, but would be a great place to put your head down after a day's fishing. Another 15" LCD screen is set into the bulkhead on the port side. For the non fisherfolk, XCalibre's expansive foredeck is the prize lounging possie. Even running hard into a 1.5m swell the deck stayed dry and just begs to have some foam pads added for sunbathing. A locker with flush fitting hatch on the starboard side holds 100m of 8mm anchor chain. A Maxwell Freedom windlass is fitted to heave the chain and 25kg Manson plough anchor aboard and a matching locker on the other side holds a 9kg aluminium gas bottle and deck gear. XCalibre hasn't been put in Maritime New Zealand survey, says Phil, but she is built to survey standards and equipped with the requisite safety gear so completing commercial survey would just entail extra paperwork. Craig Loomes' design description calls XCalibre a boat designed to meet the needs of New Zealand outdoorsmen but the tasteful fitout has given her broader appeal than that. She's a heritage boat; a blend of high tech materials and the quality of craftsmanship that can only come from a long and thoughtful build time. 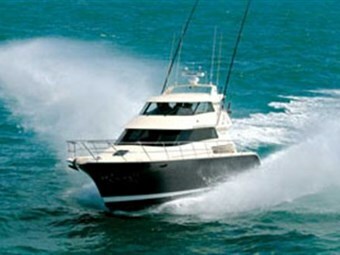 According to Craig, she'll be fishing her way round North Cape from the Kaipara for the Auckland Boat Show. And the price? "Weelll... I don't really know," he says, "we won't be building another boat like this in a hurry - you'd just have to come and talk to us..."